Gov. 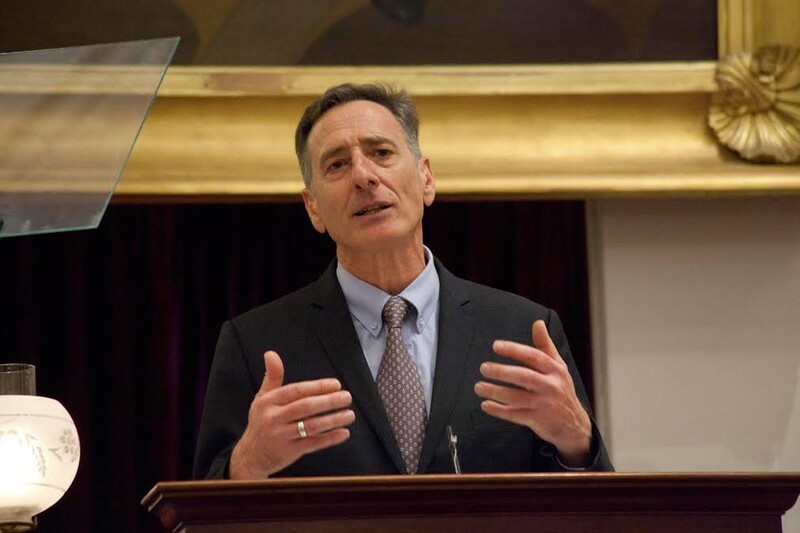 Peter Shumlin delivers his budget address in January. The Vermont Republican Party didn't wait long last week to question Gov. Peter Shumlin's appointment of Alyssa Schuren as commissioner of the Department of Environmental Conservation. By promoting her, GOP chairman David Sunderland wrote, Shumlin "knowingly created an unacceptable potential for the abuse of the regulatory authority of the department" — among other travesties. Why's that? Because Schuren, who has served as deputy commissioner since April 2013, happens to be married to Paul Burns, executive director of the Vermont Public Interest Research Group — and VPIRG lobbies heavily on environmental issues. The Shumlin administration's response came just as quickly. "For a party that consistently shows disrespect towards women, it's disappointing but not all that surprising that they are defining Alyssa by the job her husband has," spokesman Scott Coriell said in a written statement. "There is one word to describe their tactics," echoed Vermont Democratic Party executive director Julia Barnes. "Sexist." Even the boss jumped into the mud. "I think it's more than coincidence that every time the Republican Party raises conflict-of-interest issues in my administration, it always seems to be the women they're asking the questions about," Shumlin told WDEV's Mark Johnson on Monday. Yes, it would be utterly sexist for the GOP — or anyone, for that matter — to suggest that Schuren's appointment had anything to do with her husband's job. It would also be wrong. Given that she's currently the deputy commissioner, it's hard to imagine anyone more qualified than Schuren. Shuren's is not exactly a new conflict, points out her boss, Agency of Natural Resources Secretary Deb Markowitz. Since she's worked at the department, Markowitz says, the deputy commish has recused herself from all matters in which VPIRG is directly involved. "It won't interrupt her ability to get her job done," Markowitz says. Outgoing Commissioner David Mears agrees. He praises his replacement as "absolutely terrific" and notes that, in a small state, everyone has conflicts. Mears has recused himself in several matters he previously litigated, he noted, and once had to do so unexpectedly when he learned his sister-in-law's husband represented another party. "I just think it's the nature of being a public official in the state of Vermont: It's just inevitable that conflicts will arise," he says. Neither Markowitz nor Mears would address their boss' charge of Republican sexism. "I'll leave it to higher-paid people than me to reflect on what the broader societal implications of this are," Mears says. Good on them. Shumlin's cheap political hit diminishes an important debate we should be having in this state, because — guess what — conflicts arise all the time! In the past week alone, at least four situations have merited some discussion. Late last week, the Vermont Press Bureau's Neal Goswami and VTDigger.org's Morgan True both wrote about the nearly $3.8 million in state contracts Lt. Gov. Phil Scott's company, DuBois Construction, has received since Scott was first elected to the Senate in 2000. It's not exactly breaking news, but it absolutely deserves further scrutiny if Scott runs for governor, as the LG himself conceded. On Tuesday, the Permanent Fund for Vermont's Children announced it had hired Shumlin's deputy chief of staff, Alyson Richards, as CEO. As the governor's education policy adviser, Richards has worked closely with the nonprofit on early childhood education issues. Richards apparently addressed the conflict head-on. She penned a memo in April to Shumlin's outgoing and incoming chiefs of staff formally informing them she would take the job. Richards wrote that she would "remove myself from any Governor's Office decisions that might provide any material benefit to the Permanent Fund." Perhaps most troublingly, the Burlington Free Press' Dan D'Ambrosio reported Tuesday that the Shumlin administration official in charge of the Vermont EB5 Regional Center, Brent Raymond, is leaving to work for a company overseen by his office: Mount Snow. The resort is trying to raise more than $50 million for infrastructure projects through the federal EB5 program, which provides green cards to those who invest more than $500,000 in designated projects. Just last month, Raymond traveled overseas with the company to help market the projects, according to his soon-to-be-former boss, Secretary of Commerce Pat Moulton. "We do not know when employment discussions started," Moulton says, adding that Raymond was "asked to cease all work for the agency" three days after he informed her of his plans. Raymond did not respond to a request for comment. Shumlin was none too pleased. Coriell adds, "The governor has also asked [the Agency of Commerce & Community Development] to review the communications leading up to this departure to ensure that all actions were in compliance with the Executive Code of Ethics and conflict of interest policies." Huh. So Raymond's departure is a conflict worth investigating, but Schuren's appointment doesn't merit discussion? Here's a thought: Perhaps the reason the Vermont GOP raised concerns is not because they're a bunch of sexists, but because the Shumlin administration has a history of cozy relations with its private-sector and nonprofit supporters — VPIRG included. All four companies have given plenty to Shumlin's campaigns — either directly or through their executives — and have benefited from official action. So has Mount Snow, which has donated $4,000 to the gov over the years. Isn't that just as much of a conflict as Raymond's trip through the revolving door? "The governor is pleased to adhere to Vermont's campaign finance laws," Coriell says. "Similarly, we expect all appointees to follow the Executive Code of Ethics." Few things differentiate Sen. Bernie Sanders (I-Vt.) from his presidential rivals more than his aversion to super PACs — or so he'd like you to think. The Vermont independent can barely get through a speech or a campaign email without denouncing his opponents for relying upon unlimited contributions to the quasi-independent fundraising entities. "I don't have a super PAC," he wrote supporters last week. "I don't go to fundraisers where millionaires sit around the room and say, here's $5 million for your super PAC. That's not my life." No kidding! Hard to imagine too many rich capitalists jonesing to donate to this wealth-redistributing democratic socialist. But Sanders hasn't always ruled out super PAC support. And, like many of his foes, he's likely to get a little help from a super PAC run by a friend and former campaign aide. When Sanders last ran for reelection, in 2012, then-Seven Days political columnist Andy Bromage asked if he'd "ever accept help from a super PAC." "I certainly would prefer not to," Sanders responded, calling it "a hypothetical question." "But we can chat about it if, six months from now, many, many millions of dollars are coming in attacking me," he said in the February 2012 interview. "If it was a last resort?" Bromage pressed. "That's something we would look at," Sanders said, adding that he hoped he wouldn't have to. Ah. So the senator opposes super PACs unless they're necessary to win? Indeed. Just a week before the interview, President Barack Obama's aides announced that he would accept support from a major Democratic super PAC, Priorities USA Action, in his 2012 reelection race. Sanders defended the president's choice at the time. "Should you be principled and allow your opponent to spend huge sums of money and you say, 'Well, I'm a principled guy and we're going to get outspent 5-to-1, and I'm going to lose the election?'" the senator asked. Sure sounds like the approach Sanders 2016 is taking! Though the Vermonter has raised more for his traditional campaign apparatus ($13.7 million) than any candidate other than Hillary Clinton ($47.5 million) or Ted Cruz ($14 million), he's far behind the pack when you factor in super PAC support: Jeb Bush ($114.4 million), Clinton ($63.1 million) and Cruz ($52.3 million). But Sanders isn't being entirely straight when he says he doesn't have a super PAC. By law, such entities can't directly coordinate with the candidates they back, so many are run by close confidantes and former aides well acquainted with the candidates' strategy and message. Such is the case with Collective Actions PAC, which is operated by Rep. Chris Pearson (P-Burlington), who previously served as Sanders' campaign coordinator and press assistant. Founded in January 2014 as Draft Bernie, the PAC maintains the Run Bernie Run Facebook and Twitter accounts and, according to its website, plans to invest in online advertising. Pearson says his Super PAC will fund grassroots projects to spread Sanders' message, but he admits it will also serve a more traditional role: skirting fundraising limits by taking contributions from those who've already donated the maximum $2,700 to Sanders' official campaign. "We're trying to raise big checks, yes," Pearson says. "We'll see how successful I will be." Collective Actions doesn't have to file a report with the Federal Election Commission until the end of July, and Pearson won't reveal how much he's raised. But in a letter he sent the FEC last month, he wrote that the PAC "has a number of large donors who are interested" in contributing. "They hope to reach millions of voters and believe being active online is the way to achieve our goal," he wrote. Isn't it hypocritical for a Progressive pol who talks a big game about campaign finance reform to exploit the very rules he opposes in support of an anti-super PAC candidate? Pearson admits it's "strange," but he defends Collective Actions as different from, say, Bush's Right to Rise super PAC, because Sanders doesn't appear at Collective Actions fundraisers. "But yeah, if your concern is that it's a way for people to spend big money on campaigns, sure, that's what a PAC is," he says. "And do I find it a bad law? I do. But it is the law of the land." Just how independent Collective Actions is from the Sanders campaign isn't entirely clear. Spokesman Michael Briggs ignored repeated questions about the matter. Pearson says he's briefed campaign field director Phil Fiermonte, a close friend. "I said, 'Well, I think I'm going to keep the PAC going because I think there's some real opportunities here,'" Pearson recalls. "We both sort of chuckled [at] how absurd it all is, and that was it. I know that they're aware of all of it." Surely, though, Sanders would prefer Pearson to ditch his super PAC now that the candidate has decided he doesn't want one, right? Not necessarily. When Seven Days asked about it in March 2014, the campaign defended Pearson's move. "Until we overturn Citizens United, the suggestion that opponents of right-wing Republicans should unilaterally disarm and not use the tools available to them is absurd," Fiermonte said in a written statement. "To suggest that there is any comparison between a small, grassroots organization in Vermont and the multi-billion-dollar political machine bankrolled by the Koch brothers is preposterous." It's "absurd" to renounce super PACs? Tell that to Sanders 2016. An earlier version of this article incorrectly stated the name of the Vermont Telephone Company. The original print version of this article was headlined "Conflicting Stories"